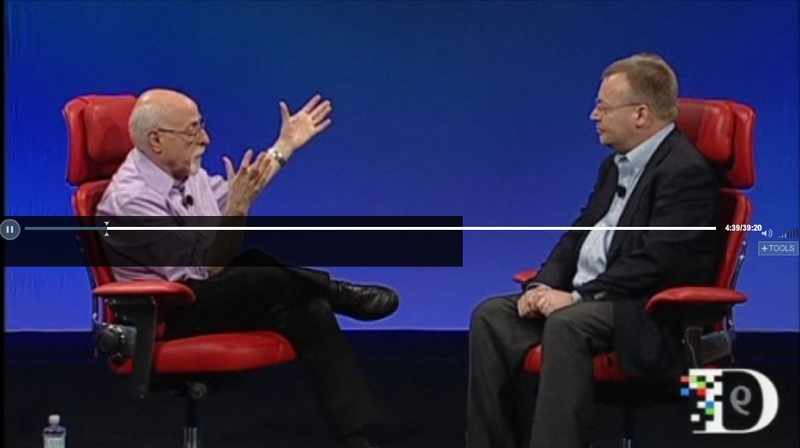 A month ago we got a 10 minute or so clip of Stephen Elop’s D9 interview with Walt Mossberg. We even got a quick glimpse of the N9 possibly SeaRay. The full 40 Minute D9 Interview with Stephen Elop can now be watched. Most of it is transcribed below for those who can’t/don’t want to watch the video. Some parts skimmed. Pivotal moment in assessment with Symbian when head of engineering for SYMBIAN said that with Windows Phone we can produce quality experience and great mobile devices in a THIRD of the time than with Symbian. Similar with Android in terms of pace of innovation but concern in extent what extent can we be involved in pattern of releases, how does this work with our own device cycles, what could we have influence of android to ensure differentiation over the long term. Challenge is over time to assess long term differentiation possible with what Android is doing. We felt with Windows Phone we could have longer term differentiation. Walt discusses the guidelines/limitations set by MS for Windows Phone so that all have same look and feel. How can Nokia differentiate here? By entering into a unique partnership with Microsoft that reflects the fact that we will focus our company on doing our BEST work on Windows Phone. [Remember, eventually Nokia WP will have much more differentiation and the Nokia Stamp. With limited time it seems that the differentiation will be slight in the the first handset.] In return, Nokia will have more flexibility than Walt described. But I need to caution you on something. When you think about that competitive roadmap, from whom do we need to differentiate? Point of competition is with Android and Apple. Think of assets we bring to Windows Phone environment, the broader ecosystem: Mapping, Navigation, Location based services through Navteq. We could keep those just to ourselves to make our Windows Phone experience better than Samsung. But that’s not the right strategy long term. We need the Windows Phone ecosystem to grow overall. I want to see Samsung, HTC to be successful with Windows Phone. [Walt: More successful than you?] I’d like to be more successful than them. Walt: I’m not sure if you sound like a guy from Microsoft or Nokia. When you have something unique, like Mapping, I dont understand why you don’t want that just for Nokia. I can understand why Joe Belfiore or Steve Ballmer would want that but I don’t understand your desire to do that. Our desire to do that is for the ecosystem to collectively grow and be competitive with Android and Apple environment, THEN you get app development and developers. They need tools and such but they need VOLUME, they need SCALE. The answer to how we would use our particular assets – first, lets make sure that ecosystem is growing. Yes let’s have ways of differentiating from other WP providers, we have that right and use it judiciously. We have to make sure developer promise is the same across all WP. We will not do something that will cause our WP application to work differently or not to work on other platforms. Walt: Was that something Microsoft Insisted on? It wasn’t a question of them insisting on it, it was a question of philosophy in ensuring the overall success, the developers have to have a developer promise. That’s only the first 10 minutes. Walt: The Fin Head of Symbian aside saying WP work would be 3x faster, how much of the decision is the fact you’re from MS, knowing people from MS, they desperately needed someone committed to their platform first. 1&2 spots filled by Apple and Android for developers. Big fight for number 3. Leo Apotheker (HP) wants to be number 3. With WP, assume you eventually want to be number 1, but have to settle for now to fight for number 3. They needed someone with scale who could commit. So it has nothing to do with your relationship with MS? Just coincidentally coming to an independent decision on that? It does and it doesn’t. 1st: MS had a critical requirement for hardware/software/services partner. That was very apparent in first generation of WP products. On other hand, Nokia was in a situation in software platform perspective – seriously challenged. With who can we partner for software platform. Together very complementary, But goes beyond that, the ecosystem and other services. Our assets will scale across the whole Windows ecosystem. Both companies will reduce expenses and increase profits. Walt: Are you paying them more or are you paying them more? Over time of the agreement very positive thing financially for Nokia. Fundamentally people will buy more devices from Nokia because of the quality of devices we can offer. Absolutely no discussion, the rumours are baseless. It’s as clear as that. We will remain in possession of the hardware business. Let me explain why it doesn’t make sense. From a Nokia perspective, the smartphone is half of our business. The other half is on feature phone. That’s a different business which is not aligned with MS interest. Walt: Maybe they’ll just buy your Smartphone business? Yes but then you have the value destruction problem, you would descale and deleverage and destroy value. Also intense competition at lower end. Relating back to MS situation, there’s clearly interest in what we do with smartphones. Best thing to do is go into strategic partnership and that’s what we’ve already done. Confidence increased in WP release, shown and launched at end of this year, 4Q, in time of holiday sales. Walt: Do the livebloggers just take it on faith that you have these devices? It is the case that because of the level of commitment Nokia is making to the strategy (with WP devices), what you should expect in first launch is THE FIRST FAMILY OF DEVICES. And then successive waves of families of devices. Walt: It’s a big market – why is there no Nokia presence here? It’s a great question – a lot of problems Nokia faces is tied into that..
A case in 2004 that Nokia had between 30-40% share in North America, even larger around the world. What happened? Many companies when in position of great strength sometimes have perception that more of a market maker in listening to consumer demands. The flip phone thing came in. N.A. consumer said flip phone important. Nokia said not so. Great deal of market share quickly evaporated. Moto took a lot of that share. Walt: Basically carriers wanted flip, Moto said yes with RAZR. Nokia said, not so much..
More of what Nokia said, we’re a GLOBAL company, there’s a different thing over here, we want economies of scale, when that difference is important, Nokia was not positioned well. When I was first involved in mobile industry working at Macromedia, selling flash to handset providers, our first trip was in Japan, first trip to NTT DoCoMo, leaders in mobility, all of the innovation, lots of innovation was coming out of Japan (didn’t someone create an awful long blog post about recognizing Japan’s involvement in innovation? It’s recognized. Just wasn’t seen because of the cut down interview) Europe was a big player. Not so long ago, (Walt: 10 years ago), we would say North America was way behind. What happened during that time. Nokia loses market share in N.A. Important date, in 2007 iPhone introduced, very high bar in user experience. Nokia is not here engaged in N.A. market place. Big pendulum swung, N.A. today unquestionably leading innovation, certainly around platforms and mobile software and so forth. Walt: Is it a global Q4 launch? Or just US or USA first of all. Walt: So US would be included in that launch? We’re still working on precisely what countries in what order, and what variants. Interesting that I don’t say any details about this before we’re ready to do so. Skipped another great deal here. Elop talks about buying competitors products, talks about some of the clones in China. Says he bought his son an iPhone that ran Android. Walt: You’ve done some tablets, I thought they were really bad. They weren’t on Symbian, they were on..
Walt: Are you going to get into the tablet game against the iPad? I’m not going to announce a tablet here today, but let me make a high level point, more specific to tablets: Whether between your PC, phone, tablet, gaming console, tv, car, whatever, clearly that connect, totality experience will define what consumers are looking for. For a company like ours that’s important. We may do it through our own products or through partnering..
Walt: So you will make a tablet? Walt: you will make a tablet? I want to answer something that I think is really important. What’s going on in tablet space is there is one tablet that’s very successful. I don’t know how many competitors are out there gathering dust on shelves. My challenge is what can we do that is uniquely Nokia that recognizes the particular strengths and market presence that we have. I’ve said we don’t want the 201st tablet that looks the same as the rest. Yes that we’ll have to deliver. Skimmed even more and written not verbatim. MeeGo- Future of MeeGo at Nokia. What’s the pitch to developers. MeeGo platform indeed we’re characterizing as Experimental. We’ve said there will be a MeeGo device this year. On operators and network traffic. Apple has a certain ‘attitude’ towards operators and how products are introduced. Android value flows back to the mothership. What would that mean for operators if Android were to gain too much market share? Part of the commitment is to say ecosystem we will deliver will be the most operator friendly. We’ve got that history. We have the most operator billing relationships. Others have chosen not to or don’t have that level of relationship. As it relates to network traffic, our effort is to drive network traffic DOWN. If you compare location based services, if you compare the network traffic generation by presentation of a map on a Nokia device today with any of the other platforms, we are at least one order of magnitude less than competitors. Finally Elop is asked how his strategy is not a ‘tweener’ strategy and ultimate end up in third place. Critical way in leadership position is to deliver the products, applications, the overall experience for the consumer that they’re looking for. Our fundamental assessment with Windows Phone is that we can deliver very compelling and very differentiating experiences. Walt: I think what he’s saying is that a tweener in the sense of control and volume. So that’s one advantage – another advantage is the service and ecosystem around that that we’ll develop with MS.
Nokia has a product today (it’s a PINK N8) the photo and optics capability are second to none. Unbelievable quality. And there’s even more than that backed up in the lab around the ability to move rapidly in software. It’s innovation like that whether it’s in optics, haptics, a whole variety of different things that you’ll be seeing from us that will contribute to the quality of the ecosystem as well.